Hi everybody, and thanks for tuning into The Skinny & Houli Show. This summer has been the road trip of all time as we take the show to remote locations for taping and meeting more listeners of the show, starting with the Hooley at Jack Desmond’s Irish Pub a few weeks ago, this week’s taping at Cog Hill for the Catholic Charities golf outing, the Cork & Kerry Elvis Night show on Friday August 19th and the Soldier Field blowout at the annual Chicago High School Football Classic on August 26th. If you can’t make it to any of those tapings, please tune in for the fun and/or catch us on the podcasts right here. We’ve also been exploring ways we can help bring back the annual South Side Irish St. Patrick’s Day parade, hopefully for March 2012 and if you have any ideas or would like to help please get in touch. We’ve been blessed to pick up new sponsors Cork & Kerry and Reilly’s Daughter recently who have joined our old favorite Flood Brothers Disposal, Jack Desmond’s Irish Pub, and Lizzie McNeill’s on the river. Skinny has been gearing up for the Chicago Marathon on Sunday October 9th and wants all his runners aboard to help raise funds for Special Olympics, of which Skinny Sheahan is President. The guy has run 40 marathons over the years and that could be what makes him so skinny! As for me, I’ve run no marathons and that’s what makes me so. …happy! And I’m also happy to report that more and more Skinny & Houli listeners are getting involved with my upcoming film “Our Irish Cousins” by making donations to this tax-deductible endeavor. Please visit our website and you can watch a ten minute preview of the film at www.ouririshcousins.com. You can guarantee having your name in the credits for the film and more when you make a donation. Thanks! Please feel free to share your favorite show podcasts via email or on facebook, twitter, linkedin, or smoke signals. 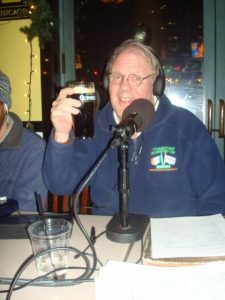 If you found a particular show amusing or enlightening or you had a friend on the show who was our guest, then spread the word with the podcasts by sending them the link and let them know how much fun you can have with a couple of old Irish guys who spend too much time on barstools! We’ve got our fingers on the pulse of the nation lately with the debt ceiling imbroglio and we’re going to do everybody a favor by NOT talking about it on the air, so go to CNN or Fox for that anxiety, but if you want to have some laughs come to WCEV and tune into The Skinny & Houli Show at 1450 AM.